The first impression you take away upon leaving the theater is the need to shower…It’s a film that engrosses one in the sleaze of the moment. From the first few scenes, we are pitched headlong into the roller-coaster ride that was Jordan Belfort’s (DiCaprio’s character’s) existence. The genius of Scorcese is highlighted beautifully in the very last scene. It’s shot in the relative quiet space of an ordinary subway car. Yet, in the context of the story, the scene is pregnant with unspoken angst and disillusionment. That is the beauty and the genius of Scorcese. He has turned the story of yet another corrupt Wall Street prodigy into a Greek tragedy, and left us, the audience, in the role of the Greek chorus. We now must fill in the blanks with meaning. That is the takeaway from this…Yet another Wall Street bad boy, one who flew too close to the sun. And yet, we are taken inside the bubble to witness the seduction of capitalism and its lingering after-effects. There is no cure in this microcosm of Corporate Greed and Excess. But in most cases, we see that there is never a wish for a cure, and not even a call to pull the plug. The denouement is a quiet end in this very wild (and long) ride. And that may be the final take. 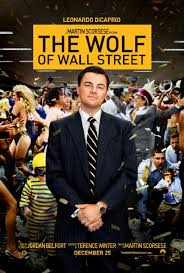 Scorcese shows his genius for understating the obvious and casting DiCaprio outside the boundaries of our daily lives….The Great Gatsby on crack cocaine Is Jordan Belfort….There is no irony in the takeaway. We see it and it is what it is. That’s the genius of Scorcese.